When you're working with multiple creative sizes and all kinds of different banner sets, it can be helpful to organize your creatives by using creative sets. It gives you the ability to handle banners per set, instead of one-by-one. 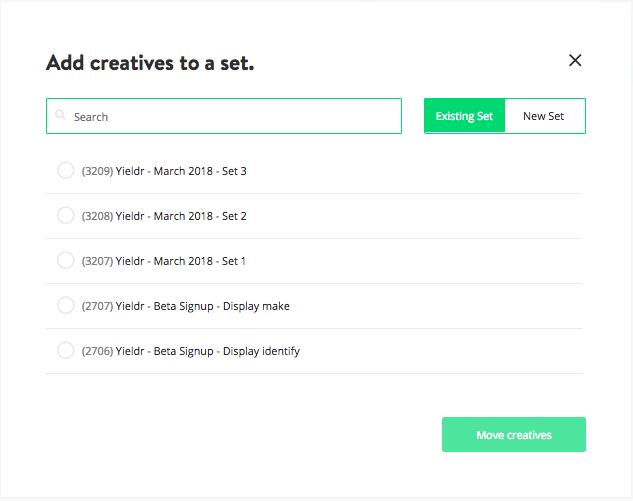 To view your creative sets in the Ads platform, navigate to the "Advertiser Name > Creative Sets" section in the left navigation bar. There, you can open a set in order to see the creatives that belong to it. Select your "Advertiser Name > Creatives" section in the left navigation bar. 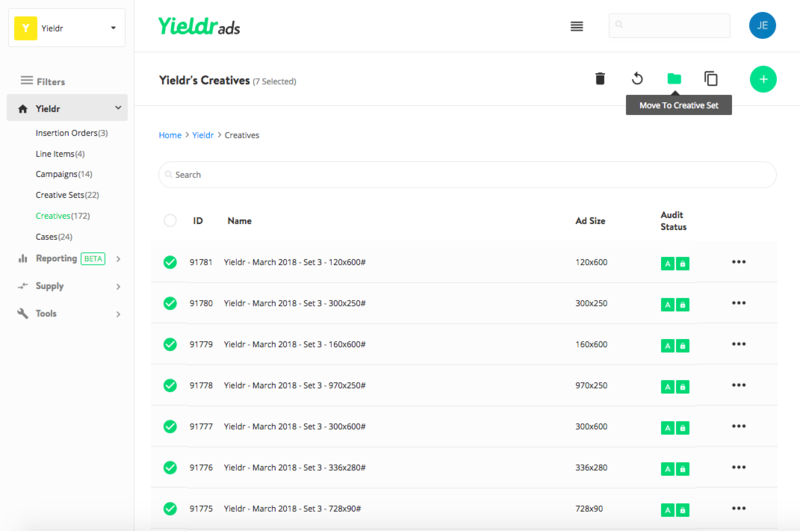 This will show you the list of all creatives that you have uploaded to the platform. Use the selection checkboxes on the left to select the creatives you want to add to a creative set. Here you have the option to add the selected creatives to a "New Set", or add it to an "Existing Set" that has been created earlier. Then you click "Move Creatives" and you will be redirected to your (new) creative set. When adding your creative(s) to a new set, fill in any recognizable name you want to use. If adding to an existing set, type a part of the folder title and it will appear in the dropdown menu. Now that you have created a creative set, you can add it to a campaign, instead of adding the creatives one-by-one.